While the brain often gets all the glory, other organs are important from an intelligence and emotional standpoint. The human heart has long been misunderstand. 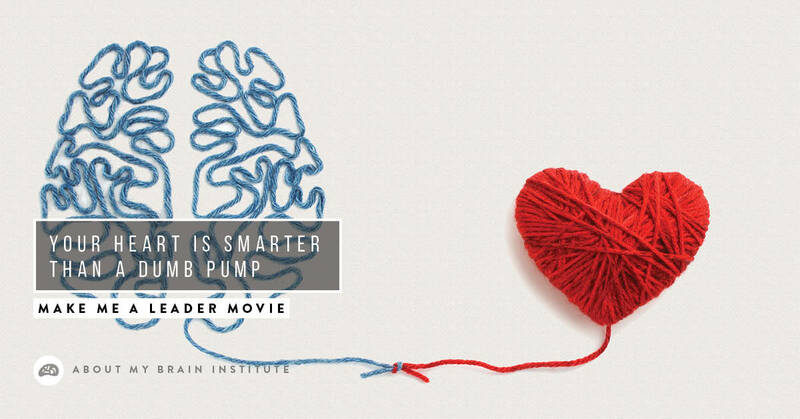 Now science has shown that heart intelligence is a thing, and the heart is much more than a dumb pump. As part of the Documentary production, I was fortunate to speak with Bruce Cryer, strategy and performance consultant, and former CEO of the HeartMath in the USA. He discussed his early career in musical theater, and how bringing that creativity and movement to the next phase of his life was important. In 1990 he was invited to study the heart using science to explain mind-body principles. At this point, most of the world felt that the heart was just a pump, working like a metronome, beating at a solid and reliable rhythm until we die. The heart was essentially overlooked in modern society. In the early nineties, researchers were able to establish that emotional state impacts the heart. Now we understand that heart rate variability is important and it may change over the course of our day for many reasons. As our emotional states change, so does the beating of the heart. These changes can occur hundreds of times a day. As heartbeat patterns change based on our emotional state, the brain is flooded with signals and information about what is going on. The brain and heart are intimately linked, similar to the mind-gut connection. When we are in certain emotional states, the beating patterns of the heart directly affect the mind. Think about how your heart races when you are angry, or very afraid. Do you think and make the best decisions in these moments? Your heart rhythms change in response to emotions and stimuli around you. Negative emotions such as frustration cause your heart rate to vary, and your heartbeat adopts a chaotic up-and-down pattern, like jagged cliffs. When you are experiencing positive, peaceful emotions, your heartbeat evens out and has a smooth up-and-down pattern. Taking slow, deep breaths allows physiological coherence between the heart and brain, helping regulate heart rhythms and stress (Cryer, 2003). Now that we have a direct link between the brain and heart, how can our emotions impact what we do in our daily lives? People in leadership roles must be able to control their emotions, or they won’t be making the best decisions possible. Think about previous bosses and managers that you’ve had. Did you have some that were overly emotional, dramatic, or who shouted or screamed a lot? Was this an environment that supported creativity and innovation? We are all humans, and we make mistakes. We all shout sometimes, and we all get angry and frustrated. But bringing this stress into a work environment is stifling. It’s never too late to change your leadership style to reflect a more calm, healthy state. HOW CAN YOU TONE DOWN THE STRESSORS? You can take steps to remove many stressors from your life. While it’s impossible to have everything work out perfectly all the time, you can learn to roll with the punches and be curious about the future, instead of constantly worrying and stressing. Making small changes can positively impact your outlook on leadership and life in general. Consider these tips for a smooth heart rate, and an emotionally-balanced heart and brain. Creating a masterpiece starts with a single paint stroke, and you can make that first stroke at any time. Breathe deeply and slowly. There are many moments in the day when we just need to take a second and breathe. Listen to the air moving in and out of your body, and imagine your heart calming, and in turn, the calmness flowing to your brain. Go outside. When you feel angry and frustrated with people around you, or even yourself, take a break and go outside. Find a green spot (or some trees if you can) and sit down. Consider yoga or meditation. You don’t even have to go anywhere to practice meditation or yoga. You can find videos and articles online to help you get started. Hopefully, you’ll be inspired to seek out a class to truly become a practitioner. There are many resources on the web to find groups near you, and many of them are free or low cost. We often hear about athletes who ‘play with heart.’ What about leaders? Why is leading with your heart a bad thing? Our hearts are an integral component of a healthy mind-body system, and it does so much more than simply pump blood around. Your heart is part of who you are, and reducing stress can help you find your true potential as a leader, as a family member or friend, and as a better human in general. Make Me A Leader is a feature-length documentary on how leaders can optimise brain and body performance to thrive in the 21st Century. Watch my interview with Bruce Cryer, Former CEO HeartMath, USA. Cryer, Bruce, et al. “Pull the Plug on Stress.” Harvard Business Review, June 2003, hbr.harvardbusiness.org/2003/07/pull-the-plug-on-stress/ar/1. Scientist, educator, author, speaker, coach, award-winning leadership specialist and filmmaker. Silvia is the Founder & CEO of the About my Brain Institute, creator of the i4 Neuroleader Model & Methodology, author of ‘Leadership is Upside Down’ and director of the 2018 documentary ‘Make Me A Leader’. Silvia is passionate about leaving a legacy of well-rounded leaders who can act and decide in a way that better serves humanity. Her clients include Microsoft, Australian Stock Exchange, NSW Government, VISA, Fuji Xerox and Manpower amongst many other global companies. What Stops People From Collaborating? The About my Brain Institute develops brain-friendly leaders, teams and cultures through practical leadership training. Our blog will keep you up to date with all our articles, news, events and product launches.